– In selection mode, clicking the node posts back the page and raises the TreeView.SelectedNodeChanged event. This is default mode for all nodes. – In navigation mode, clicking a node navigates to a new page, and the SelectedNodeChanged event is not raised. You place the TreeNode in navigation mode by setting the NavigateUrl property to anything other than an empty string. The next example illustrates how you can use the TreeNode in selection mode. 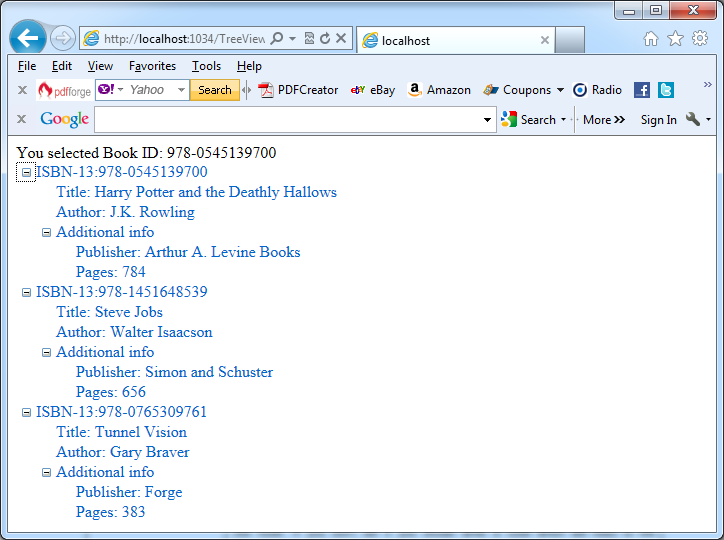 In the example as a source of data for the TreeView control an xml file named BooksList.xml which is placed in the folder App_Data is used. // the Books and Additional Info tables. // Loop through the books records. // and a nondisplayed value. // Get the children (additional information) for this parent (book). // Loop through all information about this book. // Keep all books collapsed (initially).